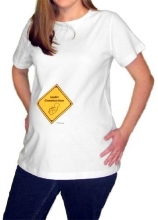 Under Construction Maternity T-Shirt Discounts Apply ! It is truly amazing that a little person can be "constructed" in just nine months. Torey says that it sometimes felt like construction...complete with hammers and nails. This design is available on White, Black and Gray shirts.